Despite the arguments in favor of this, President Obama’s actions would seem to indicate that he is earnest in wanting military strikes despite his reluctance. The theory supporting this proposition is that Pres. Obama is well aware of the dysfunction in Congress, of the inability to get most anything of substance done and the knee-jerk opposition by Republicans to anything he supports. So, when he chose to ask Congress to vote on attacking Syria, he knew full well that at least the Republican-controlled House would block it. When one consider the timeline of events leading up to his bringing this to a vote in Congress, it doesn’t seem probable that he had intended to do this. Initially after the chemical attack in Syria, Pres. Obama and Secretary of State John Kerry spoke out about the outrageous nature of this attack and the need to respond with punitive force. Pres. Obama began a campaign with the closest allies of the U.S., to bring them on board in supporting and participating in a strike against Syria. If he had truly opposed such an attack, would pressing U.S. allies to stick their necks out in committing to it make sense? It wasn’t until after the U.K.’s Parliament voted down PM Cameron’s request for the U.K. to ally with the U.S. in an attack that any talk cropped up about Obama having Congress vote on this as well. The aggressive manner in which Obama, Kerry and others in Obama’s Administration have been pressing for support of this attack also contradicts a desire to avoid an attack. Pres. Obama has repeatedly supported Presidentially initiated military action during his time in office, in the case of Libya, drone strikes throughout the Middle East and covert operations. While he could not legitimately be compared to the neocons of the Bush Administration, he has proven to be both a supporter of military action when he sees it as justified and Presidential power to order military action without the need for Congressional sanction. With the world, Congressional and U.S. public opinion opposing his stated desire to take action against Syria, Pres. Obama found himself in a tight spot if he was going to proceed on his own. If Pres. Obama went ahead on his own and ordered military attacks, he would essentially be all alone and solely responsible for whatever happened in Syria or spilled over in the Middle East due to the attack. Politically, that would have been a massively dangerous position to be in. If the American people didn’t support him and anything went wrong, the Republicans who would attack him no matter what would be hugely energized to attack him. And with the chatter of impeachment floating around the GOP recently with no legitimate justification, taking a highly opposed action like this which is disputed as being constitutional or allowed under The War Powers Act, would have looked like political Russian Roulette (with the Russians happily supplying the weapon as they do). The decision to bring the vote to Congress on attacking Syria seemed to be forced upon Obama in light of the lack of international support and our closest ally going down such a path and being rejected. When we see another country exemplifying their democracy by having a debate and a vote on such an explosive issue, it becomes difficult for an American President to make such a decision in a unilateral, undemocratic way and without substantial political debate. Sec. 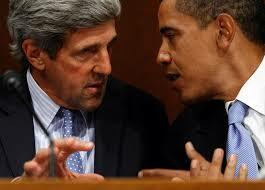 Kerry has acted on behalf of the Obama Admin to push hard on getting Congress to approve an attack. The Obama Admin has already won votes in the Senate in support of military action and for a while, it seemed like a good possibility that The House could also approve. Then, Obama would have no choice to proceed. For all of these reasons, the principle of Occam’s Razor would make sense. The simplest answer is the most probable. Pres. Obama does want to take action in Syria and is fighting to get Congress and the world to support it. If he loses this fight, the banter about this damaging his Presidency seems overblown. No President gets everything they want to happen and especially in such a difficult situation as this with the post-Iraq baggage that justifiably is in place. What is most interesting is that despite his instincts and opinion, Pres. Obama could be saved from making a very bad decision thanks to the Tea Party-controlled GOP. It is hard for the most powerful nation in the world to stand by while international laws and the Geneva Convention are flouted and innocent people are murdered in mass killings. So, to have said, “None of our business,” from the start would have looked cold, terrible and weak. Obama’s reaction was just what we would expect from any President. However, if he is blocked from following through on his decision to attack Syria, he may take a number of shots from the Right for failing but where it would leave him, the U.S., Syria and the world could be better. A bottom line problem with Obama being authorized with attacking Syria is that the first video we’ll see from the Syrians will be of the innocent women and children killed as “collateral damage” by the American attack. At that point, we would lose whatever moral high ground we believe we had to attack and Syrians would be driven to rally with Assad and against the invading child murderers, the United States. We can’t protect innocent people by killing some of them, that approach may have been American policy in the past but it doesn’t work at this point in time. President Obama was following the tradition of modern day Presidents in pursuing this action but as has been the case in a few other instances like gay marriage, deporting illegal immigrants and pursuing pot busts, Obama seems to be caught a bit behind the curve of where the American people are today. If the House kills this resolution as they seem likely to (and as they have with most any legislation that’s put in front of them) and as long as Obama doesn’t order an attack despite the lack of Congressional approval (unless the UN miraculously votes for it), responsibility for further atrocities in Syria will lay at the feet of Congress, Republicans will have taken that responsibility away from Obama out of spite and may obliviously help the man they most despise from damaging his presidency and legacy. Ad, I think highly of the President. I hope he is doing what you suggest. I hope it works. Many republicans will vote against anything the President wants. Many democrats will break with him on military action. I oppose the idea of unilateral action. It needs to be a coalition of several nations to strike at Syria. Nirek, I too have enormous repect for Pres. Obama and remained amazed at how deftly he has handles one huge crisis after another. We truly were lucky to have him in office at this time! If there was a military attack, it can’t be just the U.S. or us and a couple of our allies. If the world is unwilling to stand behind this red line, then the difficult work for Obama is to get them to in the nrear future, hopefully, before another such mass murder. I agree with you Ad Lib. Occam’s razor! Obama followed the established path in matters of this kind. The surgical strike has become the go-to club in the closet to beat one’s opponent back. I think he expected that his call to limited arms would be taken up by the usual allies and a few more. After all, doesn’t everyone hate gas…especially when it is used on non-combatants. The Parliamentary vote was interesting. I recorded the entire Parliamentary Debate to watch the whole thing (I wish we had a Parliamentary system, it is so much more dynamic and responsive). -some cited having been misled by the U.S. already in this century and not wishing to be misled again. Intriguing how this reflects the thinking in our own Congress. Obama had been marching down the road toward military intervention. He paused when he realized that no one was following him. So he turned around and went back up the road to see if he could gather in some followers. If they do not materialize I do not see him taking that long, lonely walk back down that road. Instead he will do as you suggest, Ad Lib….stand his ground in terms of the principle, call the world to task if the worst happens (and call Congress to task at the same time) and in the meantime do what can be done in diplomatic and humanitarian streams. I expect that you are correct. Murph, that really sums it all up. Obama proceeded as other presidents have and was surprised to find that Americans and the world weren’t following the precedent of a march to military action in such a case. There sure are times I wish we had a parliamentary system here in the US. Imagine how much Obama could have gotten done while President. However, in that case, Bush would have privatized Social Security just before the economic crash and Medicare would be essentially dead. I do like the open debate they have in the UK’s Parliament, the way they get Question Time with the PM and have actual discussions instead of in the US Congress where they have for the most part, prepared speeches. I liked the ACA roundtable Obama held with Congress. Why can’t we do that on other top issues, including Syria, immigration, gun control, jobs programs, etc.? Sure would breathe life into our system of democracy. And in the meantime, Obama could be working with the rest of the world and Congress on non-military ways to harm and hobble Assad. We know that the Red Line was drawn not by President Obama, but by many countries. The President simply reiterated that he agreed with the Red Line. If he said “his” red line than that probably was a misspeak. Because as I said the term “Red Line” was applied to the usage of chemical, biological and nuclear weapons. I don’t know if you saw the President’s Press conference or not. Let me say here (as I have said elsewhere) WH reportercritters are dumbasses. They are an embarrassment. Anyway, after being asked the same question numerous times and answered numerous times, the President said that he knew this was going to be a heavy lift -- especially with his own Party. He also noted that Republicans who have been chomping at the bit for military action against Syria, now suddenly oppose military action, OR they want MORE. The President is a smart man. He knows exactly with whom he is dealing. It has been reported 😀 that the President will NOT engage in any military action if Congress does not approve. Some dumbass reporter asked it that was true, at least three times -- even after he said he was not going to respond to hypothetical questions. Then whats-his-face from FOX asked the same question. It was unfreakingbelievable. But of course, President Obama handled these idiots with class and intellect. The Press Conference is up on The Obama Diary and Youtube. Sabreen, I’ve read so many comments elsewhere of Americans siding with Putin and hoping he will take Obama down, somehow. I never thought I’d see the day. Hey Sabreen, I watch MSNBC less than I used to but now that Ed is on during the week, I have to change the channel as soon as I hear his dishonest, egotistical, drum banging voice. His self-importance and snobbery towards Obama and anyone who doesn’t live in his fantasy world where Left Wing purists are geniuses and the rest are traitors and fools, is just obnoxious. I too have no time for those self-righteous emoprogs out there, on MSNBC and elsewhere. This is NOT a simple decision for Obama and presenting it that way is the height of dishonesty for these types. The media is just looking for their “gotcha”s on Obama by trying to nail his feet to the “I don’t care what Congress votes, I’m going to bomb Syria anyway” meme they’ve advanced. Obama does not want to look weak by appearing subservient to Congress and I don’t blame him for not saying in advance that he won’t attack if they vote no. I saw the questioning by reporters, MSNBC and other MSM outlets are replaying it on a loop, they’re loving the presentation of Obama as potentially rogue even though he really did answer the question by affirming how meaningful the vote in Congress is. But navigating through logic, semantics and politics no longer seems a talent for “journalists”. From all I know of Obama after leading this nation for 5 years, I do expect him to respect the will of the people as reflected by Congress. I do think though that his “red line” remark was a mistake. However, the same journalists getting on him for saying it and not attacking conveniently forget what precipitated his saying that. There were claims at that time by the Syrian opposition that chemical weapons were used by Assad. It was THE MEDIA that dogpiled on Obama, pushing on him on coming out strongly against the attack. We have the benefit of 20/20 hindsight to say that he shouldn’t have let the media goad him into making such a statement but in the moment, it’s difficult. And also, the rest of the civilized world has always stood behind the US in declaring punitive attacks would need to be taken against nations that use weapons of mass destruction. This time however, Obama speaks up for the red line the rest of the world supports then turned around and only France and Australia were standing behind him. On that front, he’s got to feel a bit betrayed. The rest of the world gives plenty of lip service against Assad but (especially the Arab nations) become vapor when the challenge comes to put their military where their mouth is. Ad Lib, I think the rest of the world turning away from committing to this, is the legacy of the Bush years that we have to live with. Agreed, it does seem that the more people around the world have time to consider what launching another military attack in the Middle East really can mean and lead to, the less they feel they can support it. Yep, the damage Bush did to U.S. credibility will continue to be a long term legacy of his. And his Admin’s blatant use of dishonesty, fear mongering and propaganda that stampeded us and many other nations into an unnecessary and devastating war has taught a very painful but valuable lesson about taking any politician’s word on how necessary wars are. The first world war was the first occasion on which chemical weapons were used on a large scale in war. The results of these attacks, mostly on British and German soldiers, were so horrendous that a prohibition of their use was included in the 1925 Geneva Protocol – subsequently ratified by 138 nations. This was the first formal recognition that the use of chemical weapons is a red line for the world community. So, 138 nations at that time signed onto the concept of the Red Line. I believe more have signed since then. Why the media and others are attempting to ascribe this “Red Line” concept to President Obama, only, is beyond me. That’s how the press tries to validate its existence, by how many times they can pull a “gotcha” on the President, even if it is a tortured or trivial argument. PRES. OBAMA: “… I have, at this point, not ordered military engagement in the situation. But the point that you made about chemical and biological weapons is critical. That’s an issue that doesn’t just concern Syria; it concerns our close allies in the region, including Israel. It concerns us. We cannot have a situation where chemical or biological weapons are falling into the hands of the wrong people. And there were other reporters peppering Obama with questions about how the U.S. should respond if chemical weapons were used. The press “pressed” Obama until he gave them a strong enough response and now, a year later, he is being just as pressed over having given them what they wanted. Of course it would have made life easier for Obama today if he had just refused to give a substantive answer to that question but as a man of substance, that’s not his style. I do think that Obama would be justified in demanding that all the nations that have signed the Geneva Convention and other treaties against the use of chemical weapons step up and say what action they want taken to respond to this instead of cowering in the shadows as many are. Obama’s taking all the heat for the red line because most nations have instead chosen a yellow line…that runs right down their backs. I was thinking about this situation last night, AdLib. (Way to give yourself nightmares, kes.) And I thought along the same lines. I thnk the Prez did absolutely the right thing in going to Congress. But — ironically — the best outcome of the Congressional vote might be a thumbs-down. And if I were in the President’s shoes (God forbid.) I would not go ahead and act on my own in that case (a thumbs up would be a different story). For many reasons. The diminishing of the concept of the Imperial Presidency being one of them. And the whole process of forcing the GOP to take responsibility for their rhetoric being another. Then when you throw in maintaining the moral high ground internationally, including the shaming of Assad and Russia, it makes his position — to some degree — even stronger than it was before. Because if Assad continues to do as he’s doing, it will only build momentum and pressure for a truly international response shortly down the road. The whole world would be watching. I have slim hopes that Assad is going to reform in the near future. And I do believe that a smack-down for this bully is inevitable. But maybe it doesn’t necessarily have to be tomorrow, and it doesn’t have to come from our President all alone. As with so many of us, my thoughts on this topic seem to be evolving daily. Hourly? Kes, like you, my perspective on this is very malleable right now, I do feel pulled in different directions. Up until this issue, most issues have seemed pretty black and white. Supporting the ACA/Obamacare, opposing actions, legislation and insults of the hateful racist Repubs around the country and in DC, supporting a fairer economic and tax system, etc. The latest word I’m hearing is that it is still possible that The House could vote for a Syrian attack but the number of supporters are dwindling and nearing a minority. Some Repubs will vote “no” just to spite Obama, they would have happily voted yes if the Pres was from their party. Such twisted people should not be allowed in Congress…or near schools for that matter. The disappointing thing about Obama is that he has supported The Imperial Presidency and continues to do so, claiming while Congress is considering their votes, that he doesn’t need their authorization anyway. If the Imperial Presidency is under threat, it is because the people have stepped up against it. Obama has shown restraint in some areas but clearly wants to protect the power grab the Executive branch has already achieved. It’s not evil, it’s what most people in the WH would do but that’s why we need a more responsible Congress to push back against that. Right with you, I too wish Obama hadn’t made that “red line” comment because that alone is a huge reason for justifying an attack and that is messed up. Because Obama made a threat, in hopes of scaring Assad away from using chemical weapons, he an others now feel that if he doesn’t follow through on it because Assad has used them, Obama and America will look weak and cowardly. Personally, I think that if Syria or Iran think that inaction in this complicated situation means they can attack the US or its military without repercussions, they would have to learn that they’re wrong the hard way. The use of deadly force that endangers mass amounts of people has to be broadly justified and that’s just not the case in Syria. As I said above and keep saying, you can’t claim morality as a justification when you avenge or try to limit the killing of innocent people in a way that results in the killing of innocent people. I heard the military folks talking about how low they expect to keep collateral damage…no, you can’t succeed if there are ANY innocent people killed. Killing just one man, woman, child or baby will be a PR victory for Assad, demonizing the US and rallying even some of those now opposed to Assad to come to his side. In Star Trek it was called the Kobayashi Maru scenario, a test for potential commanders where no matter what choice you make, disaster and death results. This situation in Syria is the Kobayashi Maru for Obama. Do nothing and Assad will probably commit more mass murders including through the use of chemical weapons. Attack Syria and potentially turn sympathy towards Assad and antipathy towards the US and possibly explode that conflict into a Middle East-wide war. In the short term, it is the Kobayashi Maru. In the long term, if the U.S. proves it is hesitant to attack other nations and kill innocent people in the process and Assad proves more and more to be the monster he is, the world will be drawn together against Assad and towards action. You have to play the long game sometimes, knowing that bad things will happen in the short term but also knowing that even more horrible things could happen in the long run if action is taken too quickly without an eye towards the future. A terrible choice to have to make, I don’t envy Obama or Congress people of conscience.